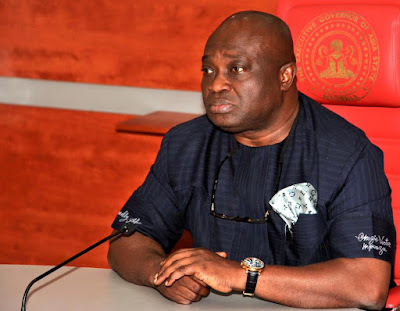 The Court of Appeal sitting in Abuja has said that the Abia State Governor, Dr Okezie Ikpeazu should retain his seat as governor of the state pending the time the court will hear his appeal challenging the judgment of a Federal High Court which removed him from office. Justice Morenikeji Ogunwumiju who presided over a five-member panel of judges said the parties in the matter must “remain as they were” before the case got to the court. At the hearing of the appeal, Dr Alex Izinyon, SAN who represented Ogah argued that Ikpeazu was not legally the defacto occupant of the Abia state house. He said there were conflicting judgments on the matter. Izinyon also protested the order of the court that parties should maintain their positions. This protest made the court to ask him who the defacto ocupier of the Abia state government house. Izinyon said he would not answer the question because to answer it would imply that he had conceeded. However, Justice Ogunwumiju, said the court considered it important to avoid a misinterpretation of its ruling. She said the ruling of the court was for parties to remain as they were should not be misconstrued as implying that the court has issued an order for stay of execution. The appeal was adjourned to August 9th for hearing. The court said it would hear all applications and the main appeal together. In his notice of appeal filed by Chief Adegboyega Awomolo, SAN the Abia state governor raised five grounds of appeal upon which he asked the Court of Appeal to set aside the judgment and orders of the high court. The governor said that the Federal High Court lacked the power to order him to vacate the seat of Abia State Governor. The governor said that the only power, authority and order exercisable by the Federal High Court was to disqualify the candidate from contesting the election based on section 31(6) of the Electoral Act 2010. Ikpeazu also faulted the judge when he held that he did not pay his tax for the years 2011, 2012 and 2013, at when due, when he was a public officer whose tax deduction was under Pay As You Earn (PAYE) scheme where tax deductions were from the source of his monthly salary by the tax authorities who isssued all the tax receipts and certificates. He also said that the Abia State Board of Internal Revenue Services that issued him with the tax certificates had not declared the certificates forged and that the trial court did not invite the issuing authorities to give evidence in the course of the trial. Ikpeazu said that the plaintiff Dr Samson Udechukwu Ogah was not a staff of the Abia Board of Internal Revenue and did not any staff of the board to testify that the tax certificates were forged. He accused the trial judge, Justice Okon Abang of violating his right to fair hearing by embarking on judicial investigation without giving him (Ikepazu) the opportunity to address the court on the issue. The governor said that the judge had no duty to investigate the contents of documents dumped on the court in the recess of his chambers with a view to finding for the plaintiff. “The decision of the judge which arose from the judicial investigation without opportunity to the appellant violated the appellant’s right to fair hearing”, the governor said. Ikpeazu also rejected the decision of the high court declaring him unqualified to be nominated as the primary election conducted by his party because false information was supplied to INEC. According to him, INEC Form CF001 which the judge relied on was not one of the grounds of qualification to contest the primary election of PDP. He said that the judge misconceived the presented by the parties and thereby arrived at a wrong conclusion which occasioned a grave miscarriage of justice. Meanwhile, the governor’s party, the PDP has also rejected the judgment and filed a separate appeal. The party said that the trial court erred in law when it held that it had jurisdiction to hear the suit which was on whether section 24 (f) of the 1999 constitution was complied with. In the particulars of the error, the appellant said Obasi Ekeagbara and Mba being “the 1st and 2nd respondents in the appeal did not pray the trial court to construe the provisions of the PDP constitution.